With its 475,000 square feet of exhibit space, 3,400 seat auditorium, 87 meeting rooms, and two ballrooms, the Minneapolis Convention Center (MCC) is a major hub for area conventions, business events, entertainment productions, as well as social and civic functions. As such, it provides an ideal place for advertisers to reach their target audiences, provided that the medium delivering these messages is bold, engaging and compelling. 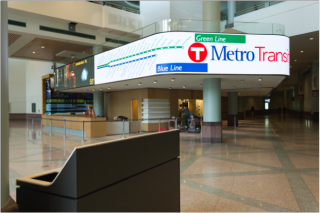 Recently, the MCC achieved its goal of creating its own 21st century advertising platform with the help of NanoLumens who provided two 5mm pixel LED NanoCurve displays, covering an area 5’T X 90’W, installed by Minneapolis based Tierney Brothers Integration. The Tierney Brothers Integration team installed the two LED NanoCurve displays in the Convention Center’s new Main Corridor Visitor Information Center. The result is a visual focal point that both informs visitors and generates a new source of advertising revenue. NanoLumens massive displays are the ideal medium to promote upcoming tradeshows, such as the Auto Show or Home & Garden Show, because they offer a clear image that can be seen from a distance. NanoLumens was the only company that could provide a curved display creating a single, continuous, video display band even around corners. When paid advertisements aren’t running on the displays, content includes visitor information, upcoming event details and more. Plus, NanoLumens offered large format LED displays that are easily compatible with the large, open space floor plan of the convention center. “In the past, we have been limited by the size factor with LED or LCD displays. NanoLumens offers a true LED continuous large format display, and with its ability to bend around curves will work with some of the most sophisticated designs. Nanolumens’ LED technology allows us to expand into different markets, such as convention centers, where large displays previously would not have been feasible to install due to design requirements or pricing.” added Tierney Brothers Jeff Lund.